Smart Allergy Friendly Education: Botan Rice Candy - Japanese Rice Candy scores big on our vacation!! Botan Rice Candy - Japanese Rice Candy scores big on our vacation!! Who doesn't love going to visit grandparents?! I still remember vividly the thrill of planning a visit for weeks in advance, flying on the planes and seeing faces you haven't seen in months... sometimes years. The thrill is NO different for my kids. Whenever we arrive, there is always a little something different waiting for them. This time it included a box of Japanese candy. The inner rice paper wrapping is edible. It is a semi-soft, chewy, slightly lemon-orange flavored candy. They loved it! The best part is that there is NO milk, egg, peanuts or tree-nuts in the ingredients. 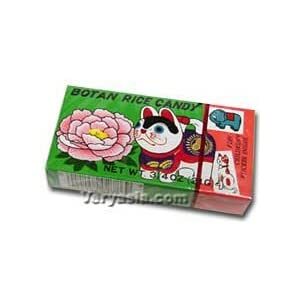 BOTAN RICE CANDY, imported by JFC INTERNATIONAL, INC., Los Angeles, CA. Ingredients include: GLUCOSE SYRUP (CORN SYRUP, WATER), SUGAR, SWEET RICE, WATER, LEMON FLAVOR, ORANGE FLAVOR, FD&C RED NO. 40 (ALLURA RED AC). If you type in Botan Rice Candy on the internet, you will find many options for purchasing these candies. I remember buying these in handfuls at the Japanese store I could walk to from my childhood home. I'm sure you can find them at any local Japanese store near your home. I would love to hear about any other Japanese candy suggestions you may have!